grandma's cookie jar: grandma's chuckles - "Hugs Are Good For You"
My grandsons have spent several days a week this summer at my house - with just a week and a half before school begins, I'm remembering things they have said and done - it has been a wonderful summer for sure! Today I'm sharing with you something my grandsons said on one of their sleepovers. We were getting ready for bed and I hugged Shane, hugged Caleb then asked Josiah if he wanted a hug, too. Josiah wanted a hug, so of course, I happily hugged him. Poppa said hugs are good for us and this surprised Josiah. They then talked about how studies show people who hug and receive hugs are healthier and live longer. To which Josiah said; "Then Caleb, Shane and I will be very healthy and live a very long time, because we get LOTS of hugs; especially at your house!" 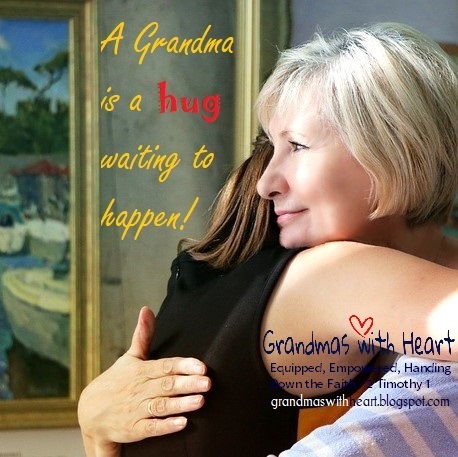 Then he looked at me and said; "And apparently you are going to be very healthy and live a very long time, too, grandma, because you give a LOT of hugs!" Caleb added; "And, you get a lot of hugs, too!" To which we all hugged again! This conversation made my heart happy, and it reminded me how vital it is to spend time with my grandsons and to let them know no matter what, they are absolutely loved. And even more important than them knowing I love them, is for them to know God loves them. Happily, on this point, the boys know they are loved by God, too!